We warned Apple to take it easy, now look what a sucker punch of a response it’s receiving from Motorola. Not that we’re not enjoying it, but this is getting shadier every day. To be fair, what else did Apple expect? In order to defend and justify the iPhone 4’s ‘death grip’, they started pointing fingers at other companies at press conferences and later on their official site. No wonder, the said companies are hitting back. Though Motorola was the first to mock the iPhone 4 by taking out an ad telling customers that they can hold the Droid X “any way you like”, they didn’t mention any names nor posted any detailed videos on their website. Apple did just that. They recently posted a detailed analysis of the Droid X on their site and YouTube, highlighting its, apparently non-existing, antenna problems. And now Motorola is making fun of Apple’s free- cases- for- all solution to the new iPhone’s connectivity problems. 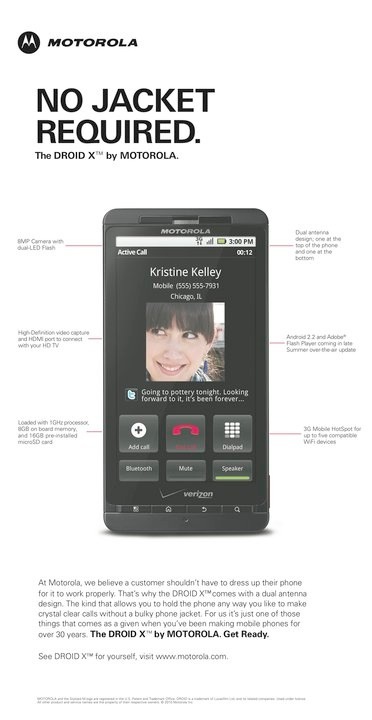 Motorola has come out with a rather cheeky ad saying the Droid X can make calls “without a bulky phone jacket.” That’s a good one, Apple should admit as no users have complained of losing signals or dropping calls no matter how they hold the Droid X. Losing a few bars of the WiFi signal though has been reported when the antenna is blocked, a problem that users don’t mind since it only happens when done intentionally. The ad’s caption reads “No Jacket Required” and it’s funny and a little mocking at the same time. Take a look below and let us know what you think.